Safe and reliable vessel transportation of Captains, Crew, Divers, Pilots and Techs. Inshore or offshore West Central Florida. 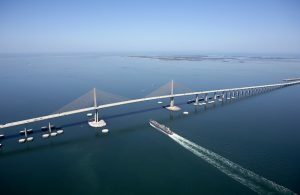 Scenic aerial photo of Sunshine Skyway Bridge and cargo ship passing under, Tampa Bay, Florida.